The Norfolk Monuments Management Project was established in August 1990 to encourage the sustainable management of Norfolk’s historic monuments. From the start it has been a partnership project, with input from Norfolk County Council, Historic England, Natural England, the National Farmers’ Union, the Country Land and Business Association and a wide range of land managers, organisations and local authorities. The project’s principal aim is to reduce the risks to Norfolk’s historic monuments and ensure their survival for future generations. It provides seeks to raise awareness and understanding of heritage management, provide guidance and support to land managers and reduce the number of historic monuments on the Heritage at Risk Register. The project supports sections of Norfolk County Council that are responsible for managing of Scheduled Monuments. Scheduled Monuments are protected by legislation and those in the care of Norfolk County Council include a ruined Priory, medieval crosses, a medieval moat, two 16th-century garden houses and a number of bridges. Since 2002 the project has been directly responsible for the management of the ruins of the church at St Mary’s Priory, Beeston Regis. 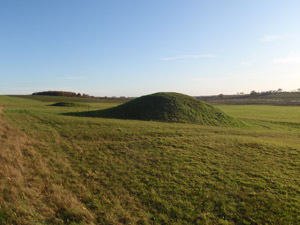 In general, the project refers land managers responsible for Scheduled Monuments not in the care of Norfolk County Council directly to Historic England for advice. The project focuses the majority of its advice on historic monuments that have no legal protection. Support is targeted on activities that have potential to harm heritage assets, including agricultural, drainage and forestry operations and heathland, river and pond/moat restoration. Important partners in this work include the Forestry Commission, The Breaking New Ground Landscape Partnership and the Norfolk Ponds Project. The project monitors the condition of a group of selected nationally significant historic monuments. These include the Scheduled Monuments in the care of Norfolk County Council, heritage assets covered by project agreements and undesignated heritage assets known to be at a high risk of damage or destruction. Since 2012 volunteers have been recruited, trained and supported to undertake condition monitoring on behalf of the project. Since the establishment of the project, Historic England has provided grants to support the project set-up Section 17 management agreements. These formal and legally binding agreements drawn up under Section 17 of the Ancient Monuments and Archaeological Areas Act 1979 commit a land manager to undertake specific works on an archaeological site (such as maintenance, preservation, public access and/or interpretation). Each signatory receives a tax-free grant in return for signing up to the terms of the agreement. Section 17 agreements and grants are mainly targeted on historic monuments on the Heritage at Risk register. Heritage assets that are likely to be added to the Heritage at Risk register are also considered. To date the project has set-up over 220 management agreements and issued over £260,000 of grant aid. The types of sites covered by project agreements have been varied, including prehistoric burial mounds, Iron Age forts, deserted medieval villages, moats, fishponds, castles, abbeys and priories. Sites currently covered include Castle Acre‘s medieval town defences, earthworks of a settlement at Shouldham, Bromholm Priory and the church of St Edmund at Southwood. Agri-environment schemes are voluntary agreements that pay farmers and other land managers to manage their land in environmentally friendly ways. Since 1990 the project has provided advice on Environmentally Sensitive Areas, Countryside Stewardship (original scheme), Higher Level Stewardship and Energy Crop scheme applications. The project is currently providing advice to land managers, Natural England and the Forestry Commission on Countryside Stewardship applications (the scheme introduced in 2015). Land managers who wish to apply for certain elements of Countryside Stewardship must use the SHINE website to request a Historic Environment Farm Environment Record (HEFER) from the project. Recent project newsletters include those from July 2015 and December 2014. To find out more or for advice on heritage management, please contact the project on 01362 869291 or historicenvironment@norfolk.gov.uk.